This is the third installment of a three-part series exploring color and pattern. I was introduced to fly fishing while traveling in Devon, England in 2013. 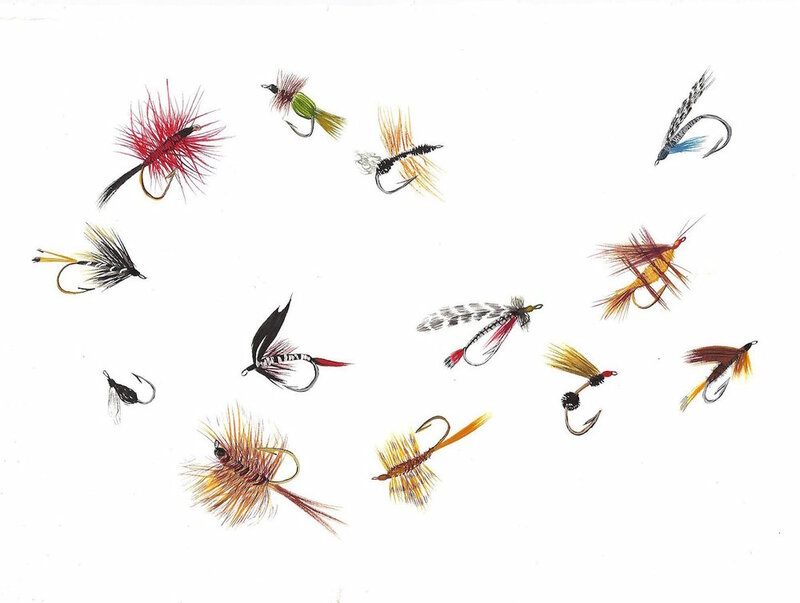 Since then, I have painted flies to teach myself about fly tying. I am most interested in how every fly is designed to attract a specific fish, mimic a species of insect, or suit an individual stream and weather condition. This series grew out of my carpet project, which sparked an interest in utilitarian artwork. I researched fly tying and fishing in the Red Rock Lakes of Montana's Centennial Valley in August of 2015 through the support of the University of Utah's Taft-Nicholson Center. Paintings focus on native species, like the arctic grayling and westslope cutthroat trout. As an artist-in-residence I learned to tie flies and fished in Montana's legendary Widow's Pool.